The teachers in my kid's lives do so much for them, and I wanted to make something special and personal for their Christmas gifts. These are also great for Teacher Appreciation Week! 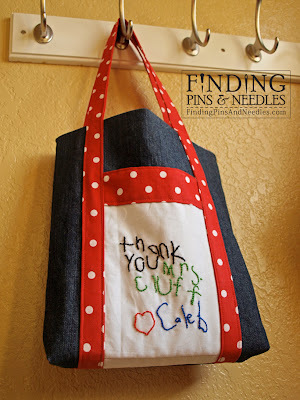 For the teacher tote, I had Caleb write a message to his teacher. 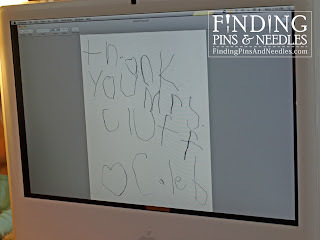 This works great if your child likes to draw.... but mine doesn't :) He doesn't enjoy coloring or writing, so I'm sure his teacher will appreciate it even more. 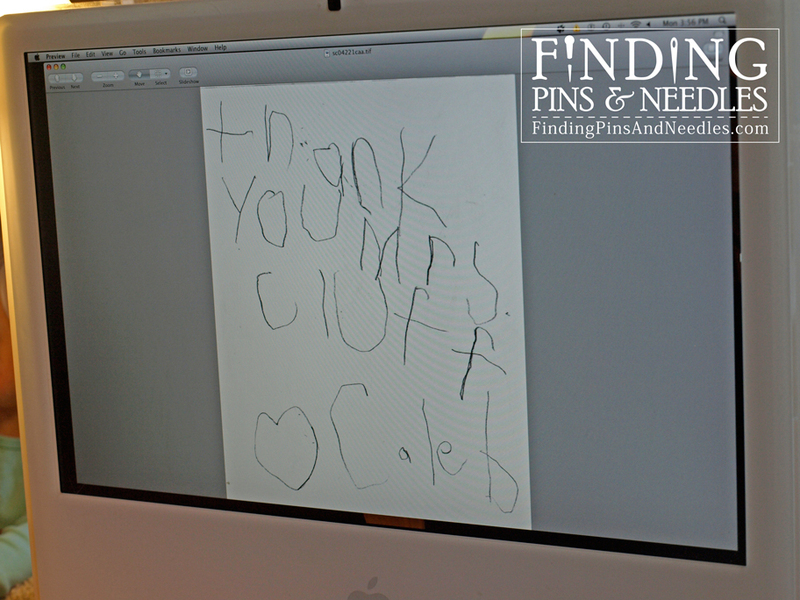 Here's how to do it... scan your child's drawing. Use a photo editing program and flip or reflect the image horizontally. 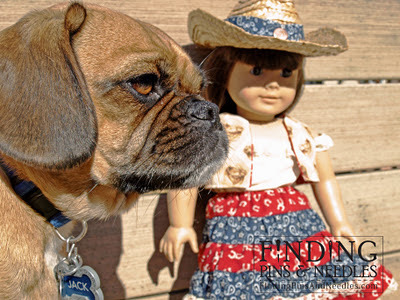 Print the image at the size appropriate for your project. Next use an iron transfer pencil to trace the image; iron it onto your precut fabric. 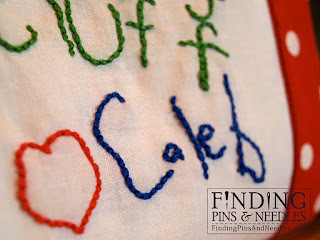 Next, hoop your fabric and sew over your image using embroidery thread and an embroidery needle. I suggest using a backstitch as it is simple and allows the lines to keep their detail. It's best to follow your child's lines from start to finish, so the hand drawn quality really transfers over. 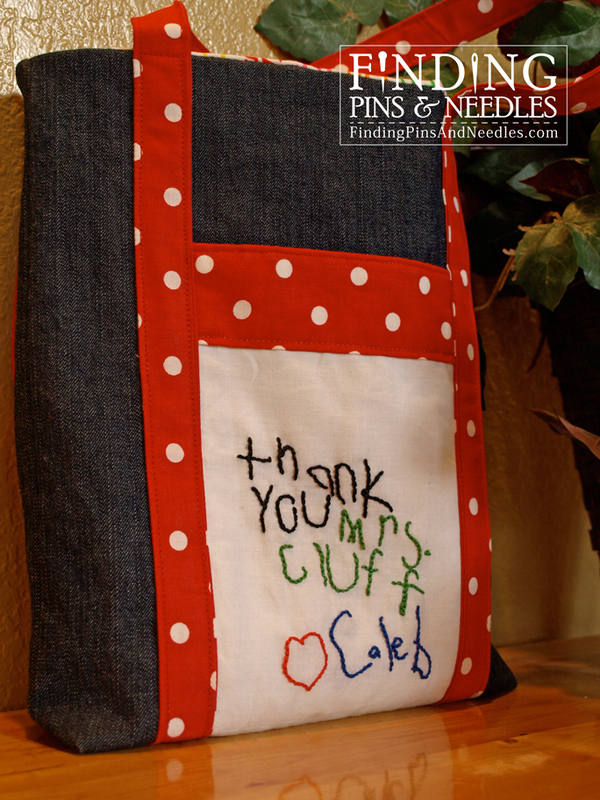 After you've finished the embroidery part, apply it to a gift. I applied mine an outside pocket of a Poochie Bag. You can click here for the complete free tutorial. By the way, the pocket on the other side is made from the jean material with the alphabet fabric for lining. 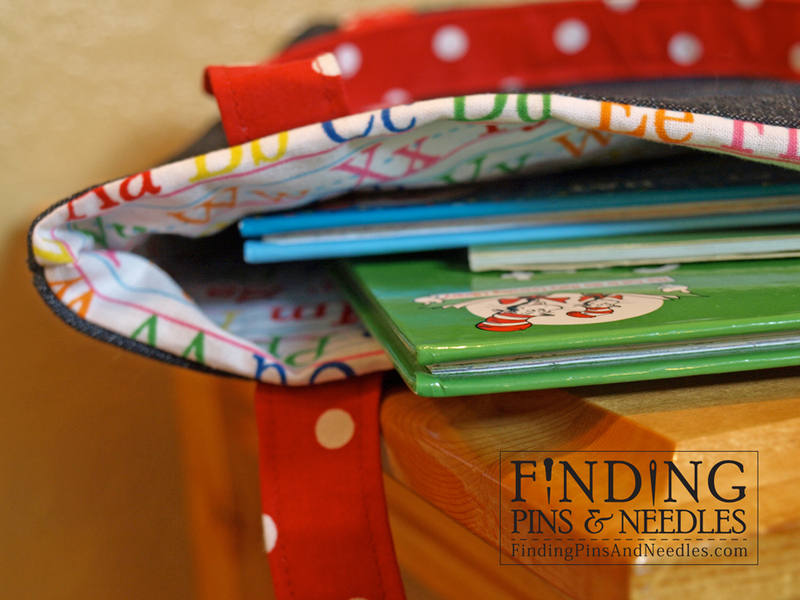 All the fabrics shown can currently be found at Joann Fabrics. Teacher Appreciation Week is May 6 - May 10, 2013. And the official Teacher Appreciation Day is May 8, 2013. 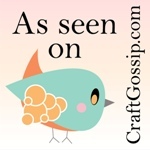 A thanks to CraftGossip.com for showcasing this post! Please join our flickr group and upload pictures of your teacher tote or any other Finding Pins and Needles projects. I'd love to see them! 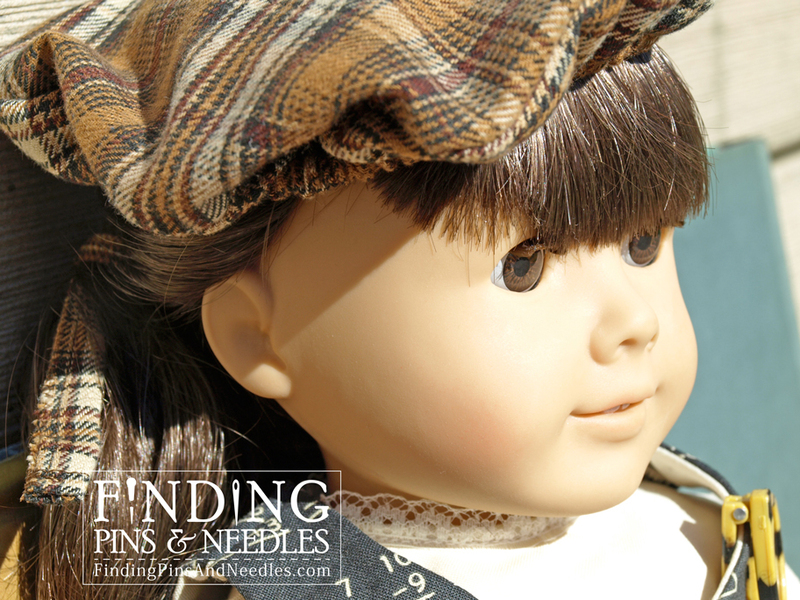 Let's take a break from making doll clothes and have a snack... or a tasty pincushion! Tutorial can be found here. It's really pretty easy, use a CD as a template, felt, needle & thread, stuffing and get creative. I used embroidery floss for the sprinkles. There's all sorts of room for embellishments and different color combos. 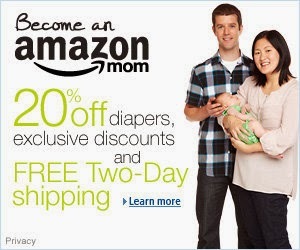 It's also a great pretend play toy for your kiddos. 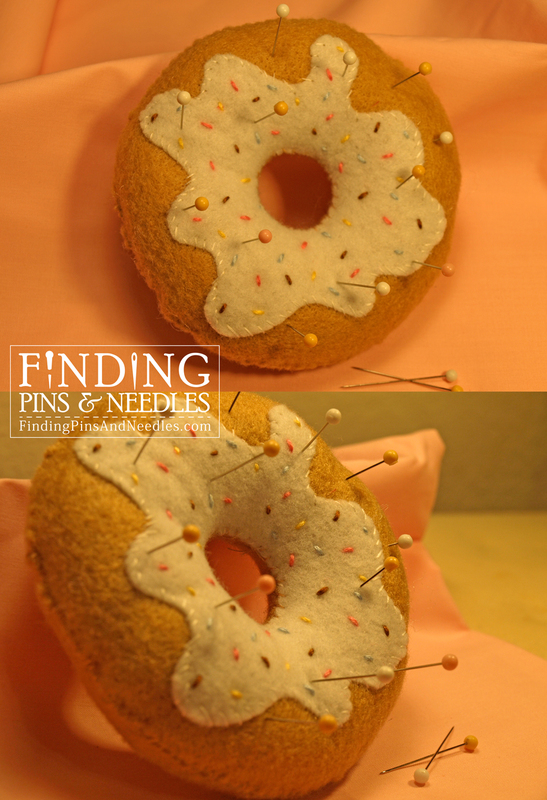 Please join our flickr group and upload pictures of your donuts or any other Finding Pins and Needles projects. I'd love to see them! The dress pattern can be found in this book: Sew the Contemporary Wardrobe for 18-Inch Dolls. 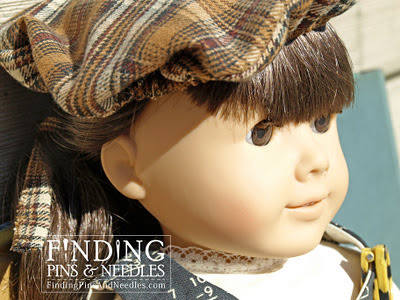 It's worth it to buy the book, there are a ton of basic patterns that you can embellish. The dress pattern I used didn't have the gathered bodice or the belt loops. An easy addition! 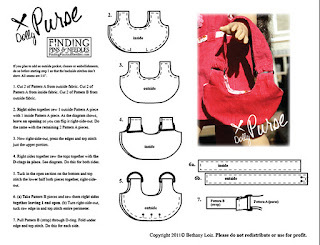 I created the purse pattern. 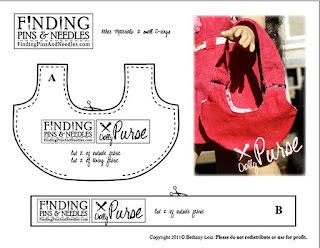 You can download it for free: pattern, instructions. 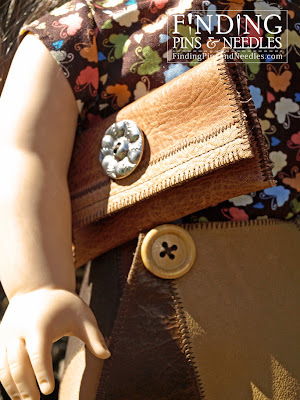 Please join our flickr group and upload pictures of your Dolly Purse or any other Finding Pins and Needles projects. I'd love to see them! 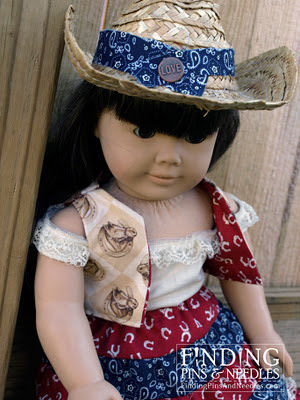 This was probably my biggest doll clothes challenge thus far, and certainly a hodgepodge of patterns. 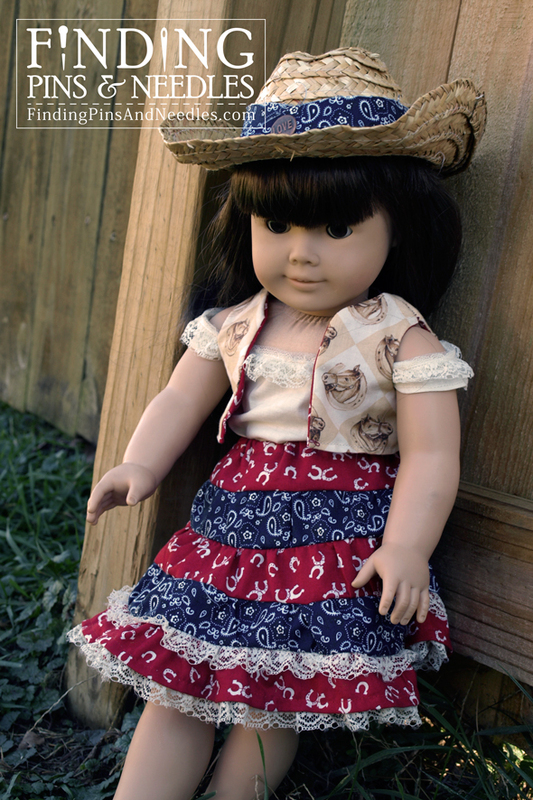 The skirt is from Liberty Jane Patterns. This was my first time sewing pleats, it was time consuming, but the payoff feels great! The long sleeved blouse I patterned myself. If there is interest, I can upload the pattern. 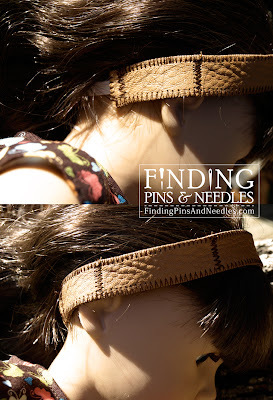 It opens in the back and uses a strip of velcro for the closure. 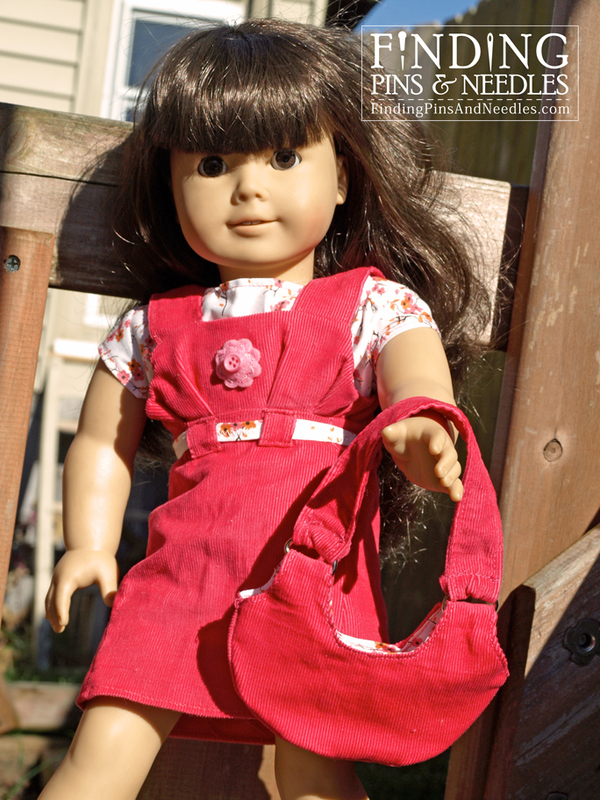 The free vest pattern and tutorial can be found here. The chalkboard is clearly a cut of the vest fabric. I glued it on cardboard. 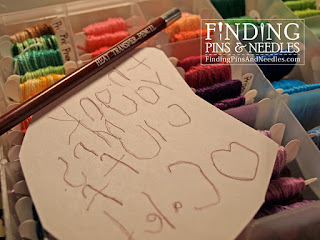 Please join our flickr group and upload pictures of your school apparel or any other Finding Pins and Needles projects. I'd love to see them! The free pattern for the skirt came from youcanmakethis.com. 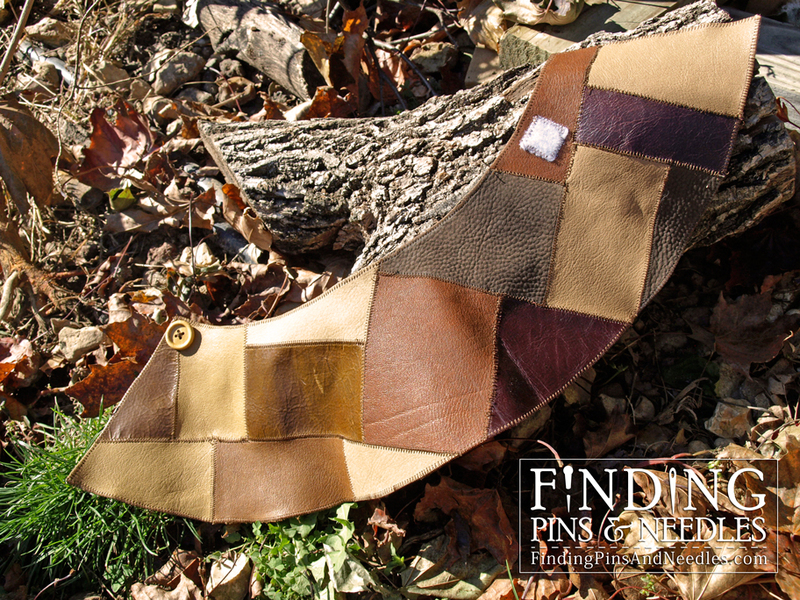 Because I used the leather the way I did, I couldn't use the pattern in the intended way. Below I show a diagram on how to alter the pattern. The free pattern for the shirt came from libertyjanepatterns.com. 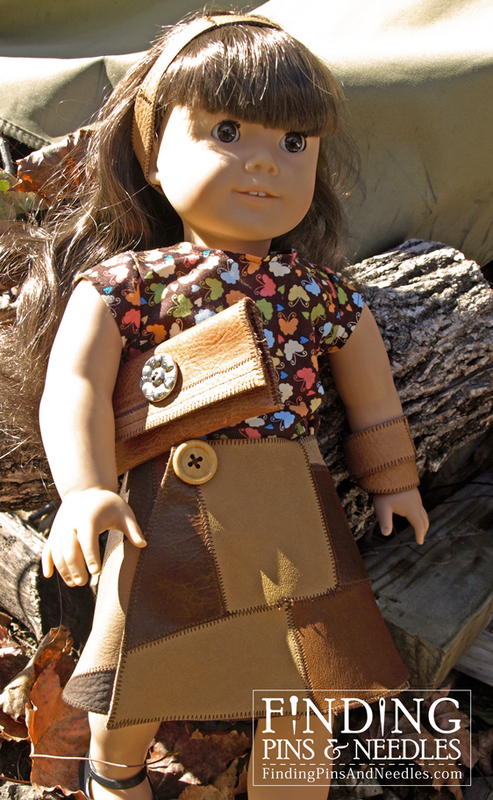 The headband and wristlet were my own, I just pieced the leather together with a zig-zag stitch. The headband has a small elastic piece sewn on the bottom (see picture below). The purse, again was just pieced. I folded up the bottom up on iteself and sewed the sides, then folded the top over. Not rocket science. 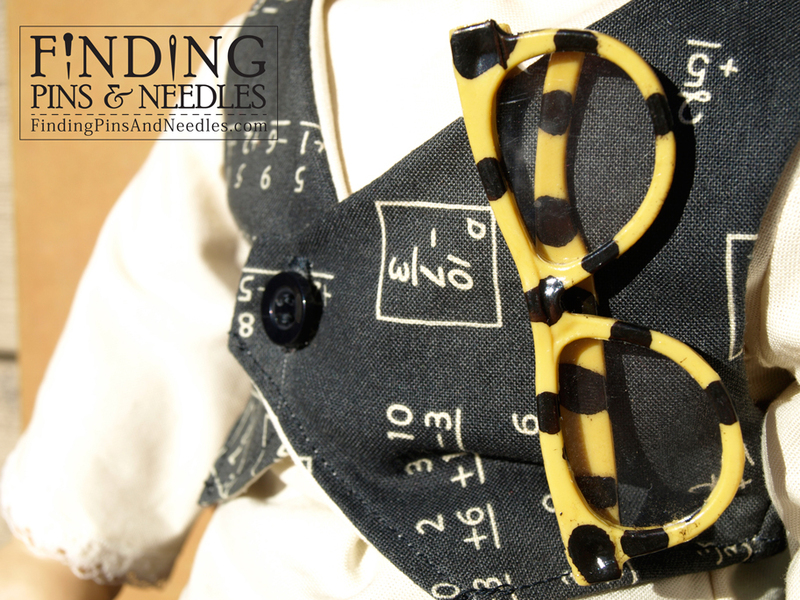 I sewed in a snap for the closure and used the decorative button to hide the stitches. 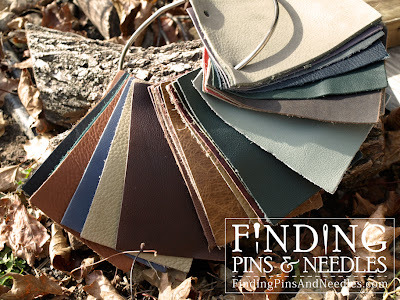 The leather I used was from a swatch ring. It was free and gave me a wide variety. 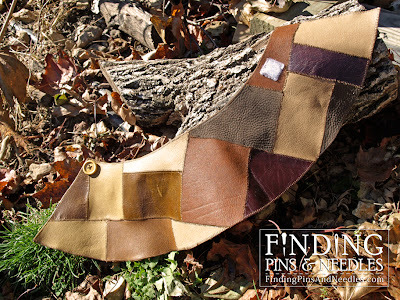 Once you have laid out your material, zig-zag stitch to piece them together. 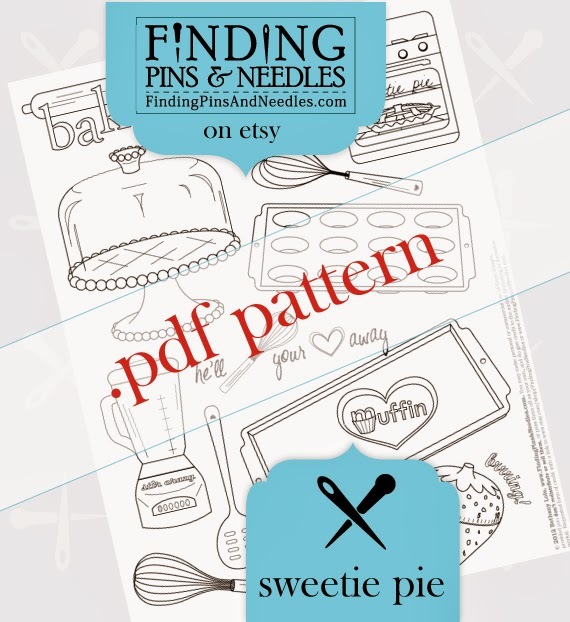 You will have to print 2 copies of the pattern since you aren't cutting on a fold, and lay them out as shown above. 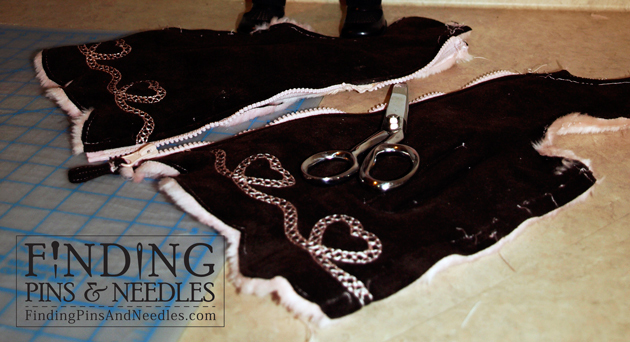 Instead of a hem, I zig-zag stitched around the outside to finish the edges. Please join our flickr group and upload pictures of your wrap skirts or any other Finding Pins and Needles projects. I'd love to see them! 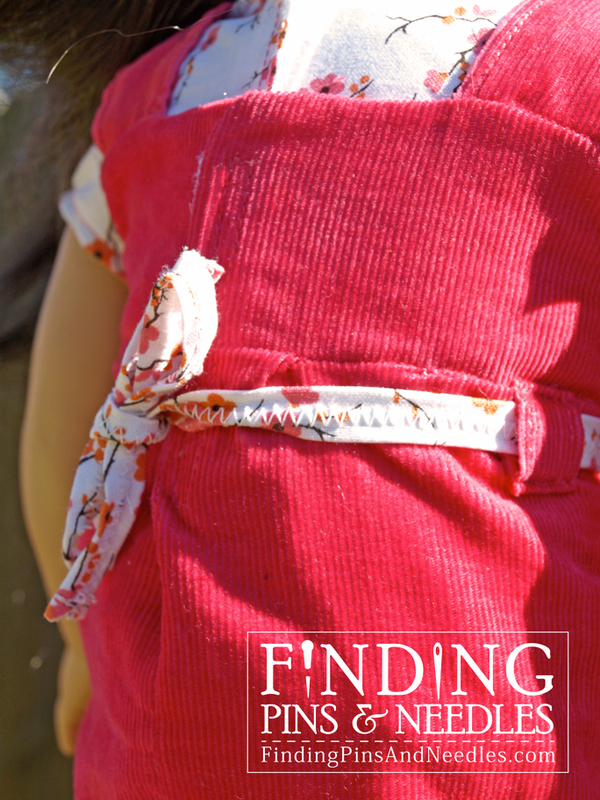 Another doll clothes adventure. This one was a hodge podge of patterns and ideas. If you're interested in recreating it, here's how I did it. The hat can be found at Hobby Lobby. I dressed it up with a brad and some extra material. The skirt pattern can be found in Simplicity Sewing Pattern 3936 Doll Clothes. My first time doing gathering, and there was a lot of it!! The lacy trimmed off shoulder blouse under the vest was my own creation. 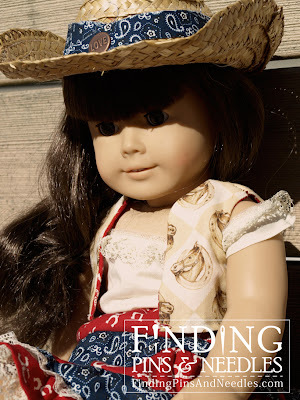 Please join our flickr group and upload pictures of your cowgirl outfits or any other Finding Pins and Needles projects. I'd love to see them! 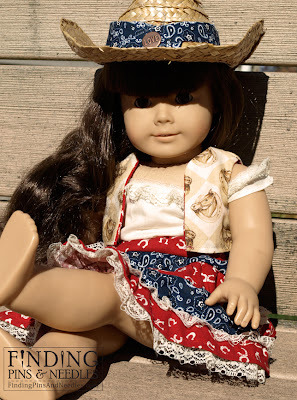 So, my daughter is only 20 months, but that hasn't stopped me prepping for her American Girl Doll phase, that I will now force her into. I pulled out my Samantha AG doll from my childhood and was inspired to make her a bit trendier. I've never really used patterns or sewed clothes in general, so this has been an experience. Periodically I'll post more outfits, over the last month I've created quite a few. This is the first in a string of posts sharing my new venture into sewing doll clothes. This was my first attempt at sewing doll clothes. 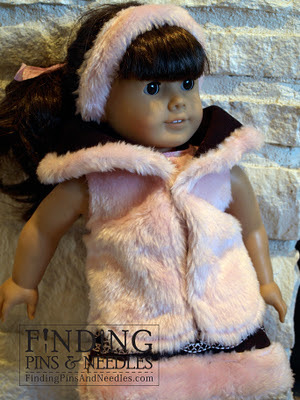 So... my daughter had this ADORABLE (12 month) winter coat, embroidery, scalloped edging, fur.... the dog ate it. Jack, my Pugalier ate the zipper. 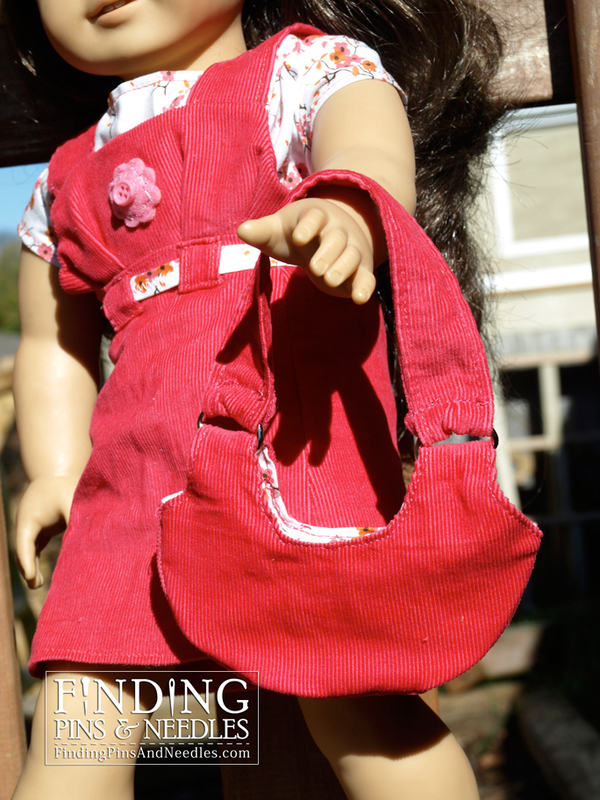 I couldn't stand to throw it out and she'd be grown out of it by the time I replaced the zipper, so I turned it into American Doll clothes. No pattern, just snip snip. 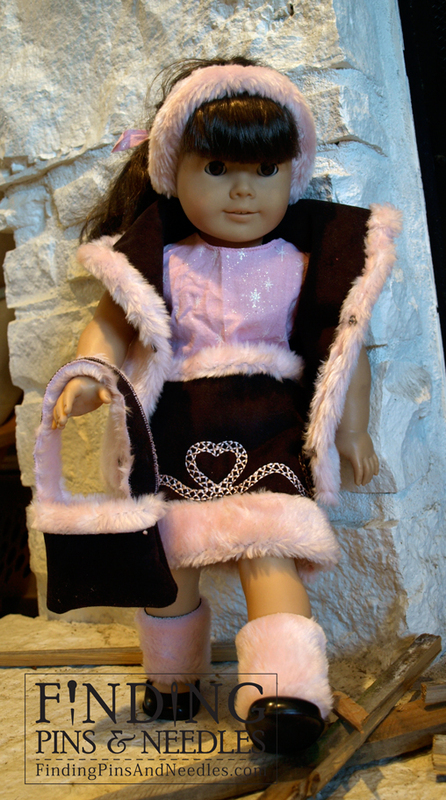 The skirt was made from the coat sleeves, the doll coat was made from the back panel from the coat. The doll coat is reversible and the back of the collar shows the opposite fabric. 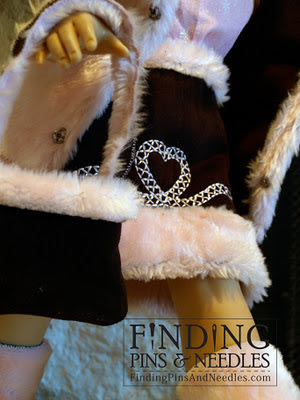 I used snaps for closures on the coat and on the skirt with a small slit at the waist. 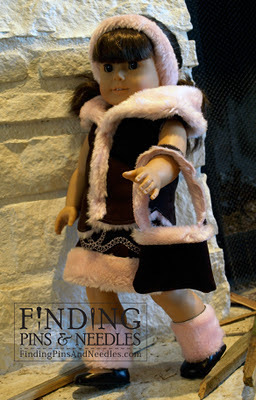 The headband is a piece of the fur attached to a short piece of 1/4" elastic. The fur cuffs at the ankle are supposed to be legwarmers/faux boot cuffs. Doll shoes are expensive, and this was a way to dress up her black dress shoes. And I pieced together the purse from more scraps. 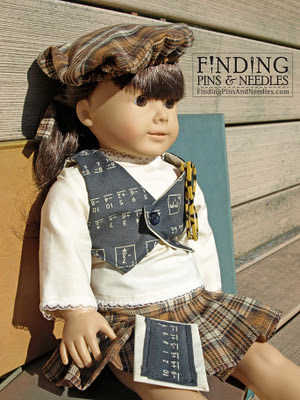 Please join our flickr group and upload pictures of your up-cycled doll clothes or any other Finding Pins and Needles projects. I'd love to see them!